Freycinet barge 38.72 m by 5.02 m wide with a draught of 2.02 m, for a displacement of 320 t approximately. It was built by the Forges de Strasbourg in 1959. Its engine is a 300 hp Volvo Penta. The three cabins (20m²) are equipped with separate toilets connected to the mains drainage, a shower with a Bourgogne stone basin, a Saumur slate washbasin and an Italian glass basin. Each cabin is equipped with a hair dryer, a television and a porthole opening on to the canal. The headboard in each of them is made of salt stone of different colours. The beds comfortably accommodate two people with their size of 160 x 200 cm. For more information, please refer to the broker's comment. Two anchors of 250kg for the bow. One anchor of 175kg for the stern. 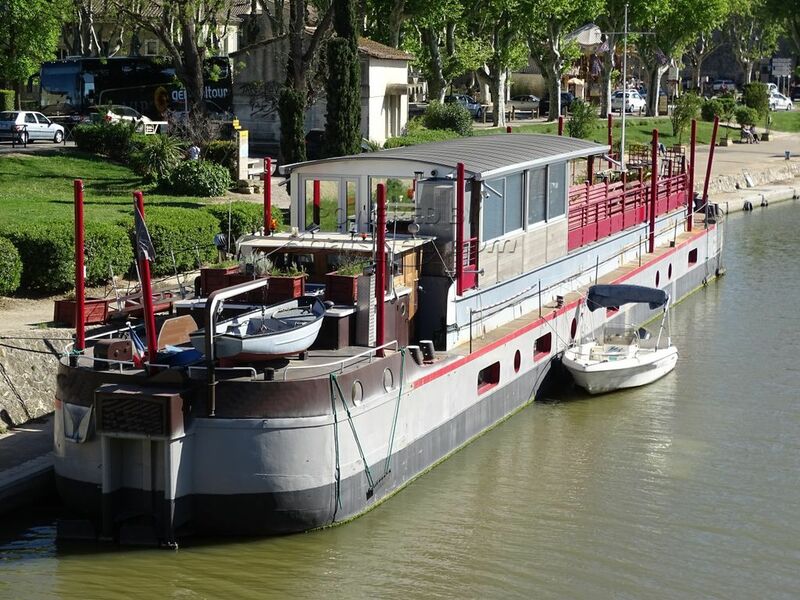 Boatshed Midi-Canals is happy to present you this B&B barge, installed in the south of France, in a city filled with History. This 38.75 metre Freycinet barge, surveyed on 17 December 2015, offers an unforgettable view of the 13th century ramparts. Note that this guest barge is particularly well rated on the booking sites. Built by the forges of Strasbourg in 1959, it is entirely fitted out with very high-end materials. As soon as you get on board, you enter a bright veranda (aluminium joinery, double glazing equipped with mirror film), used for breakfast and meals. Leaving the veranda on deck, you have access to a large terrace for relaxation, equipped with sun loungers, hanging chairs, sofas, and a SPA. The exteriors are decorated with plants in Anduze pots. At the fore end, a small private lounge invites two people to sit facing the setting sun. Inside, the steel staircase (with removable railings) leads to the owner's cabins and apartment. The three guest cabins (20m²) are equipped with separate toilets connected to the mains drainage, a shower with a Bourgogne stone basin, a Saumur slate washbasin and an Italian glass basin. Each cabin is equipped with a hair dryer, a television and a porthole opening on the canal. The headboard in each of them is made of salt stone all of different colours. The beds are a huge 160 x 200 cm. The walls in this guest houseboat are covered with Landes pine. Decorative rope adorns doorways and wall corners. Access to the cabins is via a long corridor lit by portholes overlooking the quay. Throughout the barge, the floor is made of 5 cm thick PVC. The headroom is 2.56 metres throughout the living area. The layout of the fourth cabin (20m²) is to be finished and it will enjoy a private entrance from the foredeck. Reversible air conditioning (Fujitsu Atlantic, 2016, ductable) ensures a constant temperature in summer and winter throughout the barge. The owner's accommodation is composed of a large living room and an open kitchen (49m²). Storage is possible under the stairs and in the storage area. Access to the owner's cabin is via a few steps and through the future office area. The cabin (20m²) is equipped with a WC, a shower and a sink area. The hot water for the owner's part is produced by the water heater with a capacity of 200 litres, installed in the greenhouse. The hot water in the guest accommodation is produced by two water heaters (Hord 560, of 200 litres each) connected in series to ensure plentiful supplies. A water softener (Kinetico) is also fitted. All the equipment in this room under the fourth cabin is connected to an electrical panel with circuit breakers. The entire guest houseboat is equipped with fire safety equipment and a video surveillance system. This barge complies with the legislation on establishments open to the public (ERP, french legislation). The electricity is 380 volt three-phase, with a junction box in each cabin and four meters. For more information on this barge, please contact Frédérique de Boatshed Midi-Canals. This Peniche Freycinet Automoteur has been personally photographed and viewed by Frédérique et Virginie VALLON of Boatshed Midi Canals. Click here for contact details.